Do you need a transformation with your organisational culture? Culture change can be difficult to implement. Here are a few starting points for you to think about as you consider getting us to lead your team with our Hearstyles Culture and Character Development Training. First of all, let’s agree that culture starts with the leadership. The leadership in your organisation and teams will help your employees navigate major changes. A leader who truly embraces its company’s culture and values can demonstrate how the new direction is in line with the organization’s identity. Having managers and leaders who act as role models is tied to success. According to Eagle Hill Consulting, Key Factors for Successfully Adopting Change Across Generations regardless of their generation, respondents identified understanding the need/reason for change, strong leadership, and effective communication as the most important factors in successful change initiatives. 94% of respondents who were happier after a change said that their manager was a role model during the change. Furthermore, of employees who were less happy after the change, only 50% said their manager was a role model. There is a massive misalignment between those at the top and those left to institute the change at lower levels. If the members of a company don’t understand or agree with a change, that means there’s a deep disconnect between that change and the culture. It could be that the change goes against the established values, or maybe the overarching vision just hasn’t been communicated clearly. WOW – 96% said some form of culture change is needed within their organisation! Clearly they see there is something fundamentally wrong and want to improve it. But such a high percentage… staggering! 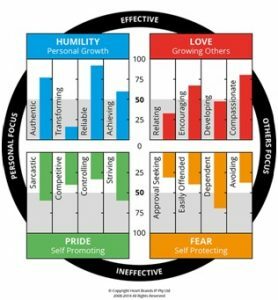 Heartstyles is a character development tool that measures the principles and thinking driving behaviour – Humility (Personal Growth), Love (Growing Others), Pride (Self-Promotion) and Fear (Self Protection). This is a powerful tool that brings insight into what creates effective people which in turn drives effective culture. Unlike other psychometric tools, Heartstyles is a life indicator that provides a measure that is changeable and dependent upon our perceived behaviour. It is a 360 degree tool that allows feedback from self, 3 or more others, as well as benchmark that measures the participant’s ideal behaviour. The Heartstyles Indicator provides a measure of 16 independent styles, 8 that are above the line (Effective) and 8 that are below the line (Ineffective). In addition to this measure phase, a Heartstyles Consultant provides training and expertise to bring insight into what drives our below and above the line behaviour. This training is well structured and powerful in delivering transformational development. It is based on sound psychological and behavioural insights that are penetrating yet easy to understand and apply. Participants are given a safe place to explore their character and culture guides and taught valuable personal and communication skills on how to grow heart in their business and community. All Heartsyles participants are encouraged to engage in the coaching program that accompanies the measure and activate (Program). It is really here that development insights can be harnessed and cultivated towards above the line more effective behaviours in areas of the client’s choosing. A Heartstyles program has benefits for all of life and allows businesses cultures to flourish, driven by the simple and elegant behavioural model of Heartstyles. 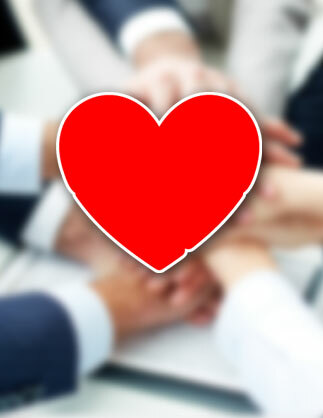 What is Heart at Work? Common sayings in business are “That person spoke from the heart,” “They put their heart into it” and “Let’s get to the heart of the matter.” Heart is the character of the person. It is the emotional intelligence, self-awareness and insight into one’s behaviour – thus our impact. It is discerning where calm command, grit, courage and resilience are required to be an effective leader, team member and person. minds of leaders, current generations and the frontline staff in the brand and the business. The heart of Heartstyles is to enhance organisational culture by transforming lives and developing character in all your people – giving every person in the organisation the opportunity to develop their potential from the bottom up and top down, not just leadership. What if your organisation intentionally inspired the hearts and minds of all your people to unlock their potential, personally and professionally? How would the heart-felt service be received by the customer? Culture is either effective or ineffective, healthy or unhealthy, engaged or disengaged, or what we term above the line or below the line. Heartstyles measures the level of effective and ineffective culture in your organisation. Heartstyles is the tool and strategy to measure and manage culture to transform people who drive performance. Heartstyles is a global consulting firm, established in Sydney Australia in 1987, focusing on developing Heart with Smart culture and leadership in organisations. Head office is in London with Preferred Partners and Certified Practitioners across the globe. The Heartstyles Indicator provides analytical data that measures effective and ineffective culture and the behaviours of the entire organisation. Visionary, progressive and courageous leaders have partnered with Heartstyles to engage frontline staff with the brand and customer, to enrich their culture and develop the talents that drive performance. The Heartstyles Indicator is not another personality profile. The Heartstyles Indicator is a character and culture development tool providing insight into the heart attitudes and thinking that drive behaviour. The Heartstyles Indicator is an online character development tool that measures the principles and thinking driving behaviour: Humility, Love, Pride and Fear. Most tools and profiles determine what “type” of person you are. These are helpful, however, whatever your “type”, your behaviour can be effective or ineffective. These behaviours are strategies we use to promote and protect ourselves; strategies we revert to under stress and with pride, fear, insecurity and tiredness. You can now objectively measure the behavioural effectiveness (or heart) of your organisation and individuals, creating a platform to enhance personal, leadership and cultural growth. There are three clear steps to implement Heartstyles with our Breakthrough Corporate Training Workshops. Watch Testimonial Videos from organisational leaders who have received incredible benefit from our Heartstyles Culture and Character Training. Because Breakthrough Corporate Training designs tailor-made solutions to your team, we require a brief meeting by phone, Skype or if you live in Sydney Australia we could set up a time to have a coffee. As Certified Heart Style Facilitators we are specialists in growing your team with Humility and Love/Heart. This training workshop will take your team to the next level of team cooperation and communication, enabling you to achieve the outcomes your team is targeting.